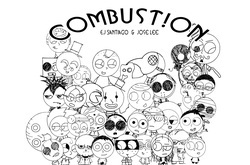 Combust!on is the first ever comic from E.J santiago and also the first book E.J. has done on his own. Combust!on has a site where several strips call home and is well on its way to being published. With over 67 characters, 100 strips and 50 never before seen strips, It will also have 25 Pumpkin spice strips, 15 Adam,Eve and Steve strips and we hope a chapter from Orlando Santiago Jr. from a lost chapter.